Purdue Pharmaceuticals, one of the companies which has made billions of dollars selling massive amounts of opioids across the country even as addiction rates and overdose deaths skyrocketed, has announced it will no longer be directly marketing the painkillers to U.S. doctors. Purdue, which the New Yorker dubbed an “Empire of Pain” in a 2017 profile, is the company that developed and released the long-lasting painkiller OxyContin in 1995 and then aggressively marketed it to doctors with campaigns presenting the threat of addiction as overblown. As the New Yorker noted, the painkiller has reportedly made Purdue as much as $35 billion over the years, while doctors and patients alike soon found that its only active ingredient, the semi-synthetic opioid oxycodone, often resulted in “debilitating” withdrawal symptoms upon cessation or even between doses. The company told employees this week that it would cut its sales force by more than half, to 200 workers. It plans to send a letter Monday to doctors saying that its salespeople will no longer come to their clinics to talk about the company’s pain products. “We have restructured and significantly reduced our commercial operation and will no longer be promoting opioids to prescribers,” the company said in a statement. Instead, any questions doctors have will be directed to the Stamford, Connecticut-based company’s medical affairs department. Purdue is credited with helping develop many modern tactics of aggressive pharmaceutical promotion. 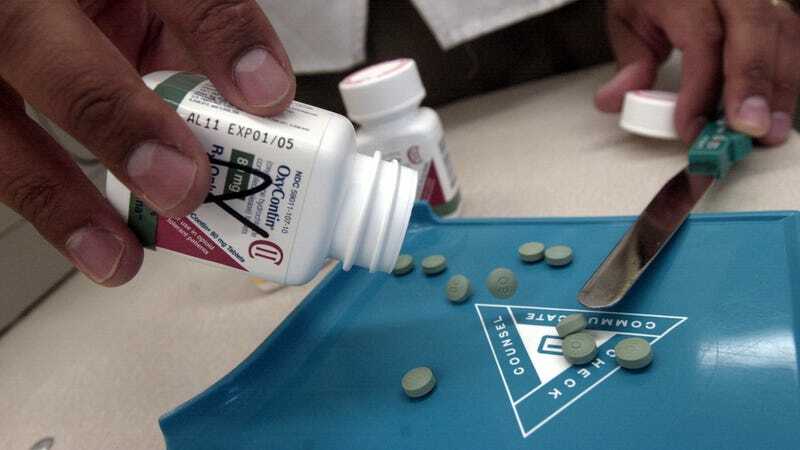 Its efforts to push OxyContin included OxyContin music, fishing hats, and stuffed plush toys. Research has shown the “the evidence for opioids treating long-term, chronic pain is very weak (despite their effectiveness for short-term, acute pain), while the evidence that opioids cause harm in the long term is very strong,” per Vox. As Bloomberg wrote, having made its $35 billion, Purdue is now positioning “itself as an advocate for fighting the opioid addiction crisis” that it helped create. Bloomberg also noted that one factor in all this might be OxyContin’s growing competition from generic equivalents, which Symphony Health Solutions told the news agency has helped to reduce its 2017 revenue from the drug to $1.7 billion from $2.8 billion five years earlier. While the New York Times estimated some 64,000 people in the U.S. died of drug overdoses in 2016, it doesn’t have data showing which of the overdoses were due to opioids or what kind were involved. But many of the deaths were related to prescription painkillers and a growing number involve one of the many analogs of fentanyl, an extremely powerful and dangerous class of narcotic that is often sold on the black market in lieu of prescription painkillers or mixed with heroin. As Vox noted, research shows that the vast majority of heroin users—and likely thus fentanyl users—started with prescription painkillers. Pharmaceutical companies which manufacture naloxone, a drug that can reverse the effects of an opioid overdose, have accordingly raised prices as it came into higher demand. Purdue and its executives paid out over $634 million in settlements over “civil and criminal” allegations related to its marketing techniques in 2007, per Stat, which is fighting in court to unseal records which could shed light on what the company knew as it was pushing OxyContin. At least 14 states are currently fighting other lawsuits against Purdue, according to Reuters, with hundreds of pending suits in Ohio alone. While Purdue’s cessation of direct marketing is likely to at least remove some of the fuel from the raging wildfire that is the opioid epidemic, it’s probably cold news to the friends and loved ones of the tens of thousands of people who have died in the meantime. Stat predicts nearly 500,000 people will die of opioid overdoses in the U.S. over the next decade, with a worst-case death toll forecast at over 650,000.